Nose-to-tail eating is everywhere, right now. The idea – and it’s a very good idea indeed – is to use every part of the animal for something useful. It’s an idea that rests on the basis that something like a pig really doesn’t have any bad bits at all, and it challenges whatever preconceived notions we might have about what ‘meat’ should look like, or how it should be butchered, or which parts are prime, and which less so. Much of this preconception has been hammered into us by increased consumerism and a volume approach to selling – it’s the prime bits that people want, so the rest doesn’t even get stocked in many supermarkets, with their fridges full of recognisable, sanitised, safe cuts. There are some exceptions to this general rule, though, and it’s worth foraging around Morrisons’ meat aisles in particular every once in a while for odd bits of offal … ox heart and the like is regularly for sale next to the choice cuts, and I’ve used that to bulk out a standard casserole of beef in whatever stout or porter I can get my hands on that’s not Guinness to great effect, and without anybody noticing. There’s good reason for this seemingly enlightened approach – Morrisons own their own meat supply chain, from the ground up, so they’re in control right the way through the process, and that means getting the best value they can from the animals they rear. Maybe pig’s ears are a step too far for the local supermarket – these came from a butcher on the market, who I’m convinced thought I was going to feed them to a dog, rather than eat them myself. Cheap, too – about 50p each, I think. I chanced on the idea for this from a superb but now sadly defunct pop-up restaurant we went to a couple of months ago, where they served crisp slivers of fried pig’s ear that were both crisp and, much as I dislike the word, unctuous. I took things a little further, and cooked mine in a confit before deep-frying them. Now, this is the killer part – the process of slow, low cooking in fat loaded with rosemary transforms those grizzly chunks of meat into something entirely different. Pig’s ears do indeed look like ears … big, floppy, slightly grizzly ears, the open side revealing a thick wedge of the cartilage that used to connect ear to pig. Dealing with these things is like Reservoir Dogs writ large. It isn’t pleasant, and any form of cooking must be transformative in the extreme. Just remember to get rid of any bristles on the pig’s ears before you start. A blowtorch is perfect for this, but if you don’t have one use …. a disposable razor. Confiting provides just such a transformation. It’s a two-stage process that starts with a period of salting, followed by an immensely long period of time bubbling away gently in a bath of fat. The salting is simple – use a few generous handfuls of sea salt, with half a dozen or so smashed up cloves of garlic and the roughly chopped leaves from a few big sprigs of rosemary, and rub this mixture all over each of four or five big pig’s ears. Place the ears in a non-reactive dish, cover and refrigerate overnight. The next morning, rinse the ears under running water to remove the salt, and put them in a single layer in a reasonably deep roasting tin. Add enough fat of your choice to cover, and place the tin in the bottom of a low oven. The fat can really be anything – duck fat is traditional for confit, but other fats work just as well for meats other than duck. I’ve had good results with plain vegetable oil, and this time, I used common 0r garden lard, about four blocks of it. Confit purists will be horrified, but what the hell. Let the ears cook slowly in the oven for about three or four hours, turning them over in the fat or oil every now and again, after which they’ll be cooked through, slightly shrunken and darker in colour. Pick them out of the fat with a pair of tongs and lay them on a chopping board. You’ll notice the incredible stickiness. Slice the ears up into strips about a centimetre wide, and throw away any knuckly or just plain unappetising bits. Pack the sliced ears into a kilner jar and pour the fat over to completely cover and seal. That’s it. Job done. 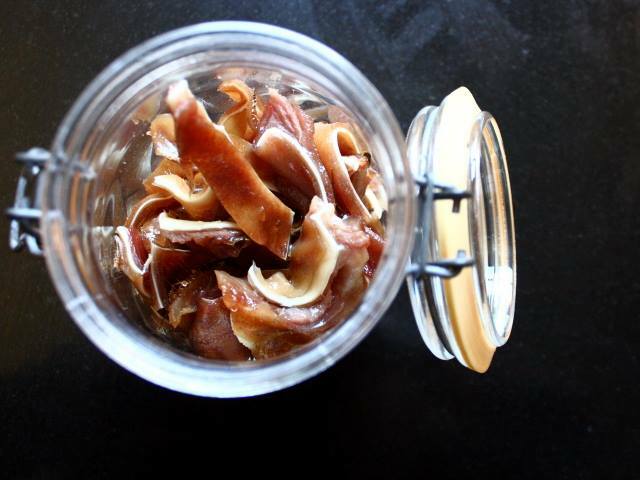 You’re now the proud owner of a jar of confit pig’s ears. Keep it in the fridge for a couple of months, tops. To finish the pig’s ears, the best thing to do is to briefly deep fry them. Dig as many slivers as you need out of the their fat, and dunk in hot fat (190c plus) for a couple of minutes, until they crackle and blister, the skin crisping in the oil. They probably won’t need any salt, and you won’t be able to eat many, such is their richness. These deep-fried ears are excellent snack food, great with beer. Think of them like exotic pork scratchings, because, actually, that’s pretty much what the are. Thanks for posting about pig ears – surely one of the most neglected bits of pork offal! I’ve enjoyed them in Chinese preparations but never thought about the way you’ve done them. On my list to try,..